Shopping for the best yoga blocks doesn’t have to be tough, but like with anything when we have choices we just don’t know where to start. For starters, we went through and explored all types of blocks, from different brands, manufacturing processes and material choices. After that we explored peoples thoughts and reviews posted online and compiled this thorough yoga block review for you to make choosing easy. If you don’t know how to use yoga blocks yet, or want to see if maybe you can learn another way of doing something, we would advise you checking out our post on how to use yoga blocks. Cork yoga blocks weigh somewhere around a pound. These blocks are a bit heavier, but they are also very durable and absorb sweat. If you do end up buying one, we recommend using a brand name as the knock offs seem to have a much lower quality overall. Cork blocks are great in that they are also a sustainable product and like all the other props will help you in getting you to the proper alignment for every pose you do. 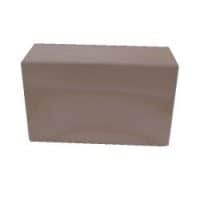 This is a foam block. They are, without a doubt lighter than the cork ones. This brings with it a series of disadvantages. First of all, it is a lot easier to carry around and it is even recommended for people who are often travelling. Again, if you decide on this type, be careful of buying cheap versions as they may smell of chemicals, poorly made, and not durable. These are the perfect block to take with you to your yoga classes. Out of all the blocks, even the high-density foam blocks are the lightest. They will work well for you when you get to the yoga studio. The wood yoga blocks are usually made out of bamboo and they are probably the sturdiest and smoothest yoga blocks available on the market. They are ideal for those times when you feel like putting on your best power yoga DVD and going at it.The wooden yoga blocks main disadvantage is not absorbing sweat, which in turn can make it slippery at times. On top of that, it is the heaviest product of this kind. If you do buy a set of these, it may be worthwhile to invest in some foam blocks for your yoga practice while you are travelling. Then again, you could just use a book too. This package includes a yoga strap as well. 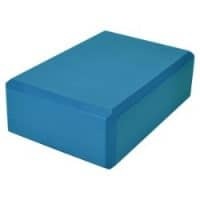 These foam blocks are made from Eco Friendly recycled high density EVA foam and are sealed so will not absorb sweat. It has a slip resistant surface, so will help keep you on point when you are doing those high energy poses where you will be dripping with sweat. Additionally this is a very light weight block so you can take it travelling easily. Gaiam is a large company based in US. They produce all sorts of yoga and fitness equipment. You only get one block, instead of two, so it’s a bit pricier than Fit Spirit’s yoga block. Its dimensions are 9″W x 6″H x 4″D, which makes is large enough for you to sit on during meditation or when you just want to rest for a while. It’s made out of strong, supportive foam that comes in many different colors to choose from. The foam won’t fall through when you stand on it. It is very durable and easy to clean. You can just wash it with a soap and dry it with paper towels. Hugger Mugger is an American company from Salt Lake City, founded in 1986. They have a long tradition of producing various yoga equipment. Their cork yoga block is just slightly smaller than foam yoga blocks reviewed here. It is very light (1.8 pounds) but sturdy. It’s grainy texture provides a superb grip that will prevent you from slipping even during the most difficult poses. It’s made out of carefully harvested cork without a negative impact on the environment. Since it’s made out of natural material, it’s perfect for those who only want eco-friendly products that don’t endanger the environment. These are bamboo yoga blocks, this block is sure to support you and be durable. Being that it is wood, it isn’t going to absorb any sweat, so if you choose this route, it may be helpful investing in some yoga gloves. Some pros about the blocks are that they are durable, and made from a renewable material. Bamboo grows quickly and easily so can therefore be sustained easily. We think wooden blocks are some of the best yoga props to have in your exercise cabinet. Manduka is a large company with stores all over the US. It was founded in 1997 and is known for its various yoga equipment. Manduka Cork Block is made out of 100% renewable cork in a way that cork oak trees are preserved. 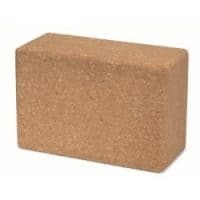 Just like any other cork block, it’s more expensive than foam blocks but if you want natural, eco-friendly product, you have to pay the price. It comes in standard size of 9″W x 6″H x 4″D. It’s perfect for people who don’t want to deal with a chemical smell that usually comes with foam blocks or simply want all of their products to be natural. Wrapping up, our top pic is the Heath Yoga Block set which includes a strap. The overall value is great. Having a strap available will help you when you are starting out in those tough positions where you can’t quite stretch yet.